Moving On sails Atlantique as Saint Pistol fires in President! Fabrice Souloy’s Moving On bagged his first harness career Group 1 in the Prix de l’Atlantique at Enghien on Saturday. The 6yo Swedish import, a model of consistency since arriving in France in 2014 with 7 wins and 4 podiums at Vincennes from 13 starts, has now boosted her tally to 9 French victories. Although drawn 11 behind the mobile gate, Franck Nivard gave the 10/1 shot a great trip behind the leaders and managed to wear down front-runner Timoko a hundred metres from home. The €225,000 Prix du Président de la République is France’s biggest handicap chase. 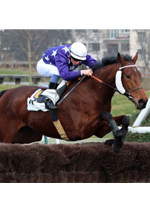 The 4,700 metre Group 3 run at Auteuil on Sunday has brought together a field of 18. Like Aintree’s Grand National and other open big-race handicaps, the event is extremely popular with punters as it often throws up a few surprises with some nice prices. This year the weights have been raised to the minimum 62kg, so the bottom four are carrying between 3 to 5kg more than their basic rating. This means the top of the table have a clear advantage. The €200,000 Grand Prix de l’Atlantique is the only Group 1 trot at Enghien racetrack – a reminder the course boasts both trotting and jumps circuits. This year, the 2,150 m race (with autostart) will play out on Saturday, April 18th.